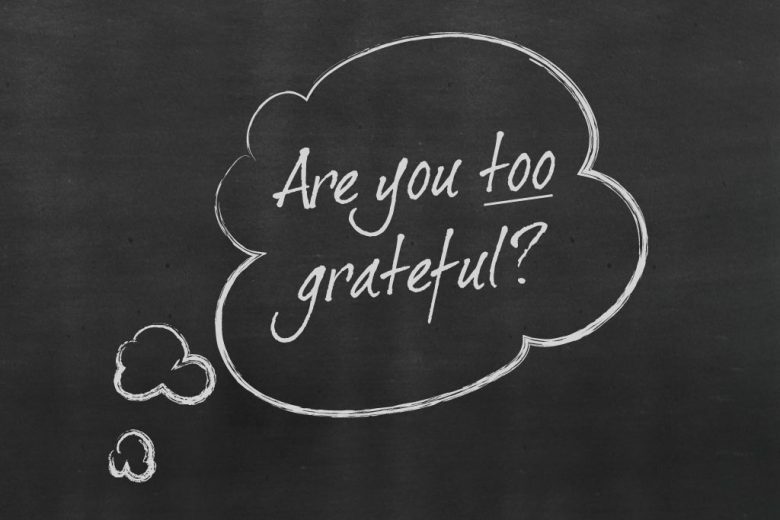 Is being too grateful hurting your career or business? While being grateful for the things and people we have in life is a healthy and positive attitude, is it possible to be too grateful? And can too much gratitude actually be holding women back? Do you ever gush with gratitude when a client, colleague, friend or family member does you a small favour? Or inwardly feel so thankful for what you have that you tell yourself you’d be mad to rock the boat and ask for more? Jessica Chivers, managing director of The Talent Keeper Specialists has come to realise that, while gratitude is an important factor in subjective measures of happiness and wellbeing, it is possible to overdo it – with potentially damaging long term consequences for our work and home lives. And of the two sexes, it is more common for women to be overly-grateful for what we have. I run coaching courses for people returning to work after a career break, and 60% of my clients are women. As part of our comeback coaching programmes, we use a tool to measure 60 strengths – one of which is gratitude. Increased access to development opportunities. Rather than these women’s gratitude making them appreciate what they have, and feel content with it, I often sense a quiet, self-directed frustration. You see, despite their conscious thankfulness, they’re not happy with their status quo. That’s perhaps because, in the right measure gratitude is a terrific thing. But too much can lead to acceptance of something that doesn’t entirely fulfill you, and even stagnation. And for many of the women I speak to, their gratitude has stopped them pursuing something that would have made them happy. It has kept them in roles and positions that they have outgrown or no longer suit their situation. Stopped them from going for pay rises and opportunities that they deserved. And generally stunted their careers. The answer though, is not to simply stop being grateful. Instead, we need to find a way to blend gratitude for what we have, with, in the right situations, a reasonable agitation and desire for something larger or better. And it’s not just employed women who can self-sabotage their careers with undue gratitude. If you run your own business, you also risk being overly grateful for some of the custom you receive. If customer feedback says you deliver a spot-on service, or sell amazing products, then maybe you should perhaps feel a little less grateful – you’re superb, so why wouldn’t people do business with you? You’re not successful through luck or the charity of others, you deserve it because you have created or picked the right products, and are selling them at the right price with great customer service – and you have worked hard to build your business. So instead of overly-appreciating customers for being kind enough to buy from you, you should take ownership of what you are doing well, and do more of the same. Look for ways you can go even further, and grow your happy customer base even more. Are you too grateful in the home? Similarly, if you see it as predominantly your role to maintain a home and care for the people and objects in it, it’s easy to become too thankful for the contributions that others may make. Think of three ways a situation or experience could be better and act on one of them. Raise your expectations of a friend, colleague or family member slightly and spell it out if you need to. Ask for something that feels a little bit cheeky. Have a go at modeling the least grateful person you know, even if just for 10 minutes. Imagine you’ve overheard your line manager say you deserve more but until you ask for it they won’t give it to you. Let a client or customer know how else they could benefit from your products or services. Ask a colleague how much more they would push for in a given situation. When someone asks how you are, say “I’m good and I’d be ecstatic if you would…(insert request of your choice here).” Just think of the pleasure your unexpected response might bring – “fine” is such a dull answer. If you really struggle to be anything but content and grateful, and are reluctant to rock any boats for yourself, think about ways that your dissatisfaction and desire for something more or different could benefit others. The woman who makes a case for pay transparency or campaigns for flexible working is helping to shape a more positive culture for everyone in her office. And the parent who clearly asserts that domestic operations are everyone’s responsibility is raising children who take ownership and know what it is to graft. Jessica Chivers is managing director of The talent Keeper Specialists and author of Mothers Work! How to Get a Grip on Guilt and Make a Smooth Return to Work (Hay House, 2011). Jessica also writes a regular blog.